(Supposedly) dayre-ing my cooking adventures. I actually have a lot to share on dayre but I've been feeling a little lazy and ive been pretty busy as of late! Today was a new milestone for Sophia. She took her afternoon nap at the in laws place for the first time! I prepped her before she left. I told her that she needed to take her afternoon nap on the bed. She asked me why? told her because there's no cot there. I asked her if she can do that? She said yes. And off she went. Very proud of her and I'm glad the in laws place can be an option for us to put her there when we need to! 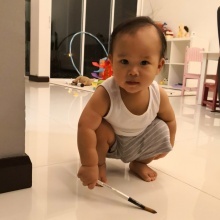 Zachary's first foray into"art" 😅. 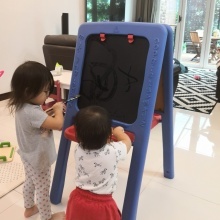 Sophia was quite interested in the art easel at @theminidiary s place. So I decided to finally bring out our art easel that was passed down to us. Today they "painted" with water. This activity occupied them for 20 minutes before they called it a day. Join our community! Download the app, and get updates from girlthatcooks. Remove this bar by logging in.